Toilets, tables, a couple trails and a great view. In a nutshell: Toilets, tables, a couple trails and a nice view. Minuses: Not much more to offer than what you just had in the car, other than a stationary place to eat and a (sometimes arguably) more optimal place to relieve yourself. Not much to say about this one. It is a good place to stop for a real bathroom. Several guidebooks state it has port-a-potties – one even says you can camp here – all old (incorrect) information. No camping, but they do have a genuine, deluxe plumbed flush-toilets here now-a-days! Wooohoo! 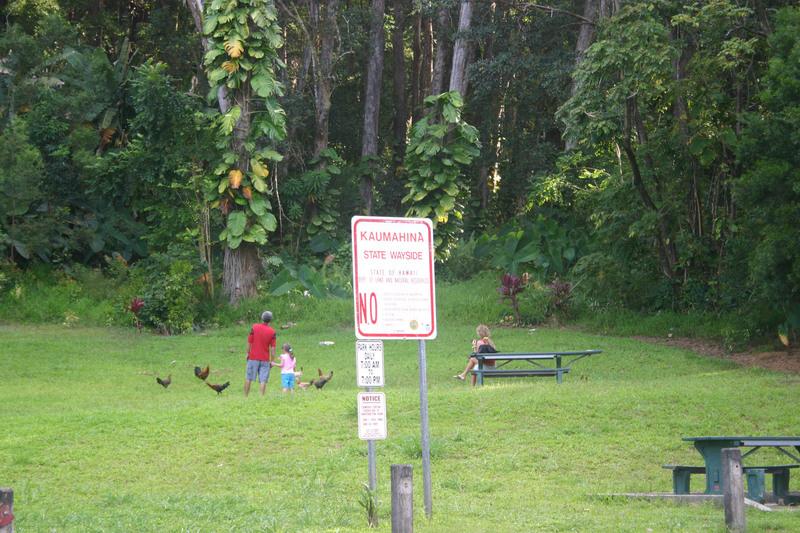 Besides the number one attraction (the toilets), Kaumahina Park has some stunning overlooks of Ke’anae Peninsula – that said, so does the stretch of road you just turned off of. Kids will like feeding the wild chickens that live here. The State’s website says hours are 6am to 6pm, but the big-ol-sign at the park says 7am to 7pm. I doubt anyone will come out this far to kick you out if you show up a bit after closing, so go crazy and hang ’till 7:10 if you want. Facilities: Restrooms, picnic tables, trash cans, no drinking water.